​Take note Middletown Planning Board and Town Council -- this section contains Village 35 declarations of opposition, rants, rage, and prayers too, from Middletown residents. We, the citizens, demand that you continue to act in our best interests. ​The following is taken from a lot of sources, including: concerns heard at meetings, media opinion pages, petition signers comments, Facebook posts, and email. Here's just a few, not in any particular order. . .
"This will negatively impact all the citizens of Middletown and-it is true-the Planning Board will attend more to our concerns with the help of an attorney and engineer. If you are able to contribute something I urge you to do so. I have-and I will do so again!" 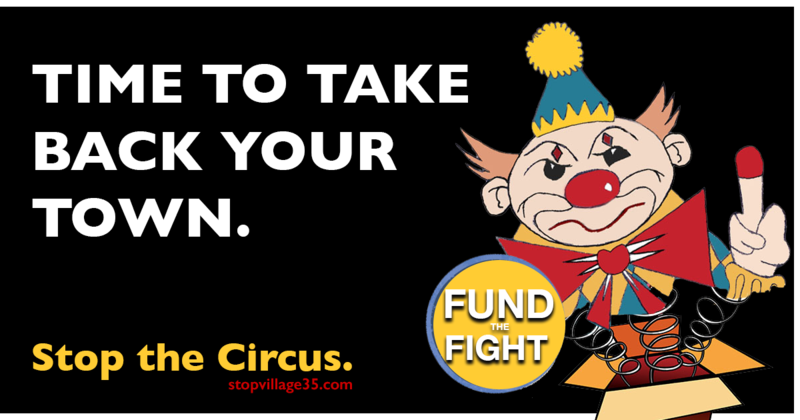 FUND THE FIGHT. click here. Charade is defined as an absurd pretense intended to create a pleasant or respectable appearance. Or to put in in terms of the most relevant vernacular, it’s an attempt “to make a silk purse out of a sow’s ear.” In the early morning of August 21 the Middletown Township Committee members collaborated to impose upon its residents an outrageous charade in the attempt to allow a poorly planned set of commercial and residential development proposals on 150 acres to move forward (on a site larger than the size of the Monmouth Mall in Eatontown). 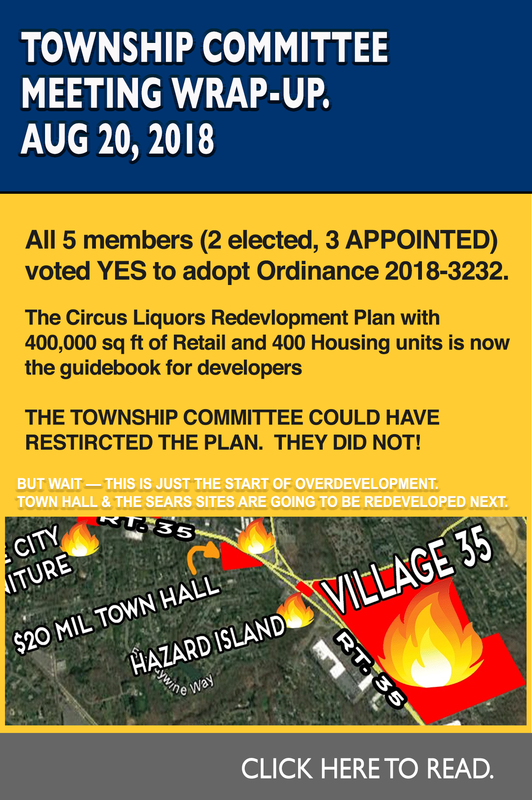 At their meeting, the Township Committee passed the Circus Liquors Area Redevelopment Plan (CLRP) ordinance for the area formerly referred to all those in the know as Village 35. The ordinance allows development of a proposed and woefully passé commercial strip and a not-so-secret mutually agreed upon friendly “builder’s remedy,” an excessive proposal justified for affordable housing. The missed opportunity by the Township Committee to create an enviable smart growth site is most regrettable. I recognize the need to provide affordable housing and applaud proper efforts to create reasonable solutions, just not this one. I also recognize the right to allow a property owner to develop their holding in accordance with a pre-determined zoning regulations, or in this case, a negotiated lawsuit settlement between various parties including principally Mountain Hill Associates (owners of the property) and Middletown Township. My intent for this letter is to voice concerns about the redevelopment process as well as the shortcomings of the proposed development. For the sake of full disclosure, I am a non-Middletown resident member of the Middletown Open Space Preservation Committee which requires participation by the Executive Director (currently me) of Monmouth Conservation Foundation (MCF). The mission of MCF is to save open space, create parks, preserve farmland, safeguard waterways, protect wildlife and educate on conservation and the environment. I am also a planner and member of the American Institute of Certified Planners. The adoption of the CLRP sets the stage for the development of Middletown’s second largest primarily developable area and violates all aspects of MCF’s mission, which is why I attended and spoke at the hearing against the ordinance. 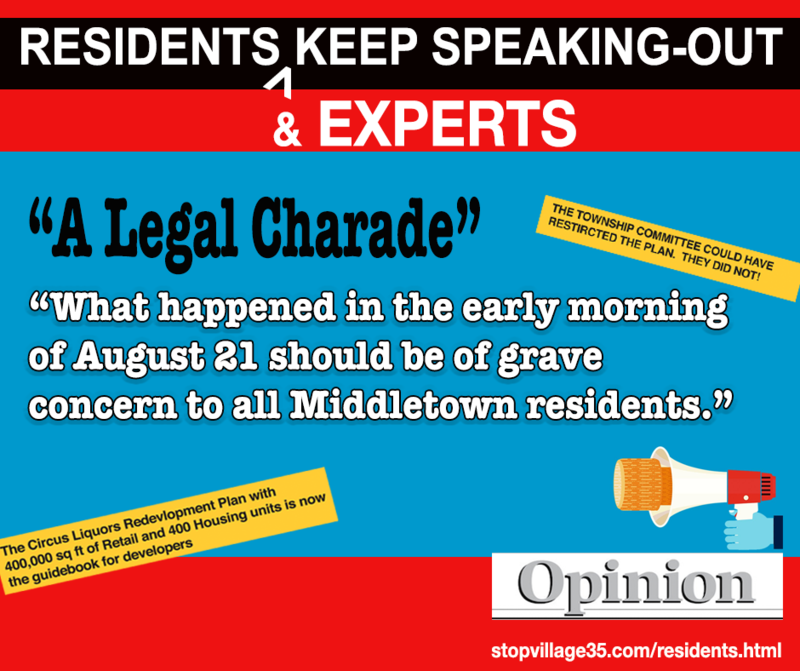 What happened in the early morning of August 21 should be of grave concern to all Middletown residents. ​Whether the property should be declared an area in need of redevelopment is open to significant conjecture. Why should the onsite productive farm comprising a large percentage of the area be deemed derelict? Why is it appropriate to cut down hundreds of trees which provide habitat for wildlife and safeguard two significant headwaters qualify for redevelopment? Plain and simple, this part of the redevelopment area is wanted by the township for 70 affordable housing units but carries with it the “baggage” of up to 330 market rate homes. What is wanted is no justification for designating the area in need of redevelopment and, hopefully, will not survive a legal challenge by Minding Middletown. There are other sites through- out the township which qualify for affordable housing and can and should be provisioned without a “builder’s remedy” necessitating four market rate units for each affordable unit. The proposed (on-the-record) commercial component of the redevelopment area is unfortunately just another strip mall. Yes, the existing structures are in need of replacement and the commercial component of the site should provide for more retail, just not at the intensity or necessarily the mix proposed. Earlier in the month, the planning board met to determine whether the proposed redevelopment ordinance was consistent with the township’s master plan. Minding Middletown folks and their professionals and all attendees were denied the right to interact with the board. Most likely legal, but morally inappropriate. The planning board purposefully denied public interaction. ​At the Township Committee hearing, I watched and listened as individual after individual wanted to comment or ask questions and were told repeatedly by the mayor, that those were for planning board consideration, not relevant to this hearing. Under normal rezoning hearings, individuals are allowed to interact, but apparently are precluded from doing so when the rezoning is through the process creating an area in need of redevelopment. Interestingly, the mayor called on those who signed up to speak in reverse order. The obvious purpose was to deny Minding Middletown individuals and their professionals from speaking early and communicating at the hearing’s onset the most relevant objector commentary for the benefit of the audience. Minding Middletown finally spoke in the early hours of the morning when most attendees had left. Also, by going in reverse order, the mayor subjected the objectors to significant additional professional fees. The mayor’s second refrain of the evening was that the Minding Middletown lawsuit prevented public interaction before the redevelopment ordinance introduction. How ridiculous is this statement that just four individuals comprising Minding Middletown would preclude public interaction by the other 3,200 residents? Nothing more than a convenient and inexcusable explanation. ​The final chorus of the evening was that the underlying zoning would allow far greater development than the area being declared in need for redevelopment allowed. Perhaps true, but the approval process based on conventional zoning would entail real public input, whereas the redevelopment ordinance hearing did not. At the hearing, I asked why the traffic study commissioned by the township wasn’t made public before this hearing. The response was that it will be released for public consumption at the planning board hearings on the residential and commercial applications. Sorry, but traffic impact from redevelopment zoning are an important consideration when addressing rezoning. I suspect the traffic issues are onerous and were intentionally kept secret. Residents were once again denied full disclosure. I also asked that the Township Committee explain Payment In Lieu of Taxes (PILOT) and whether they intended to sanction it after adoption of the redevelopment ordinance. It is the norm to enact PILOT with redevelopment, but they committee demurred ostensibly because their intent is to use PILOT to direct most of the in lieu payments to the township coffers and substantially reduce school funding. Families with children attending public schools should take notice. It was obvious that the Township Committee had made up their minds well before the public hearing. They were going through the motions of a public hearing only because the state statutes require it. The entire process was a charade. ​THE MIDDLETOWN TOWNSHIP ENVIRONMENTAL COMMISSION REQUESTED POSTPONEMENT OF THE ORDINANCE UNTIL THEIR RECOMMENDATIONS WERE INCLUDED. IT DIDN'T HAPPEN. 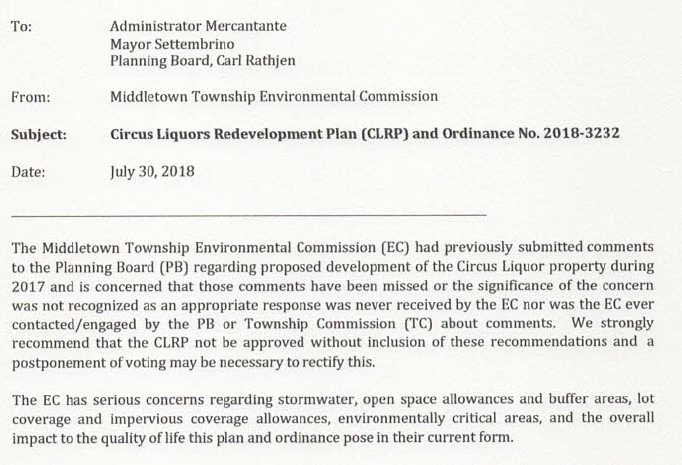 In a misleading effort to justify their decision to approve the Circus Liquors redevelopment plan, members of the (Middletown) Township Committee continuously stated on Monday night that a vote in favor of the plan was required in order to make certain that the owner of the property would not build even more houses and retail space on the property. These statements are conjecture. Rejecting the plan would not be a guarantee that the developer can build an even larger project. There are no approvals in place to permit building and a long and arduous approval process faces the developer. The developer desperately wants to build this project through redevelopment and not the standard approval process because if a redevelopment plan is adopted: 1) the developer will get an enormous tax benefit by most likely entering into a PILOT (payment in lieu of taxes) agreement; and 2) the developer will get the pre-packaged zoning that it desires. After working with the public to ascertain what we want for the site, the Township Committee should convey that information to the developer and insist that it be included in a redevelopment plan. Because the developer will be getting significant benefits through adoption of a redevelopment plan, I doubt that the developer will walk away from a revised plan that incorporates more of what the public wants. Rather than give the developer what it wants as per a “dialogue” that Deputy Mayor (Tony) Fiore said is ongoing between the developer and the Township Committee, the Township Committee should begin a dialogue with the public about what we want at this site. It would be nice if the Township Committee spent more time talking to the public and less time talking to the developer. The narrative being spun by the Middletown Township Committee that they are unable to conduct information sessions regarding the redevelopment plan because a lawsuit was filed is false. The lawsuit filed by a citizens’ group challenges the decision by the Township Committee that the property in question fits the criteria for “an area in need of redevelopment.” That is the only issue in the lawsuit. How that issue is decided has nothing to do with the specifics of the redevelopment plan such as how many houses and how much commercial space will be built, what buffers will be in place, or what open space will be preserved. The information sessions would deal with the redevelopment plan, not the decision that the area is in need of redevelopment. The Township Committee is spinning this false narrative to distract the public from a preordained agenda to railroad through this redevelopment project with as little public participation as possible. We, the residents of Middletown, deserve better. "All people in the state need to be vocal, but it starts on a local level. We elect these people. We’ve been open with the town and they have been completely secretive and covert. We want something everyone can live with, and they’re operating under the fallacy that this will mean more rateables for the town.​"
"Luxury housing? Let’s not sugarcoat this. 400 townhomes on top of each other, (about 55 acres) including a 4 story apartment building with 80 low income units. The only thing luxury about it is the builders private home." "​Also, a gigantic dining movie theater. The devil is in the details / placement of the buildings bordering existing residential neighborhoods. Using retention ponds as open space. Inadequate supporting infrastructure, ie Kings Hwy east, Rt 35, Tyndall jughandle. Traffic and drainage problems are all but guaranteed." "I’m not blaming the current politicians for scenario we are now facing, however, it is up to them to keep the development within the limits. I’ve seen the planning board deny variance requests before, but they were for much smaller projects. Let’s see what they do now. This plot of land has a long and ugly past. At one point the owner wanted something nice for the town. Then he felt betrayed and now it seems like they just want to build the biggest middle finger that they can. The middle finger of Middletown. " "Rateables actually spur more development which ends up increasing taxes in the long run. Rateables also require services (police, fire, first aid) which increases taxes. It’s called the rateables chase. Decreasing development is what keeps taxes low. Middletown has one of the highest tax rates in Monmouth County because it It overdeveloped. Upper Freehold has the lowest taxes because it has the least amount of development." "I am deeply concerned about how this proposal will affect our quality of life in this beautiful Township. If approved, the two projects are certain to exacerbate the traffic problems and environmental hazards that are a growing threat to our way of life in Middletown. The residential proposal will stress our schools and public services, placing a heavier burden on taxpayers. ​Originally conceived as a "town center" many years ago, the proposal is now an amorphous project striving to find a purpose. Super markets, some of which are closed, empty movie theaters, and restaurants abound on Route 35. This proposal is wrong for Middletown. The only folks who will benefit are those who stand to make a lot of money. "The contempt shown for townspeople is stunning. The township committee should have been honest 3 years ago about their desire to see this developed. But they have consistently lied and advanced this plan in their back room dealings. The site was always going to be developed - but something less intense would have been acceptable. They have no respect for the history of Kings Highway East or the character of the town. Build anything so they can attract rateables. Why can’t they balance the books? Incompetence or worse? Time for change." "Shocking to think that anything like this could even be entertained. Lincroft gets no affordable housing and its Four Ponds... and we get this... on top of something the size of Jersey Shore Outlets? Something is seriously wrong here." "The proposed project is beyond the scope of what the area can handle in terms of roads, utilities and schools. The proposed stores and amenities are redundant. If you are looking for new sources of tax revenue, ask owners of existing strip malls in our town to improve their properties. Look at the new TJ MAXX - that is the kind of smart growth we need. Remember, just because you can do something, it doesn't mean you should. This project smacks of greed." ​"I am opposed to building more buildings for movies, shopping, and the like. We already have tons of that around we do not need anymore. There are plenty of abandoned buildings up and down Route 35 from Hazlet all the way to Redbank. We don't need it we don't want it. Many people move to this area for the beauty of the natural habitat. We do not need any more trees removed. It is already congested with shopping that any more would really tip the scale causing many traffic delays." "The beauty and charm of Middletown should be valued, and preserved. 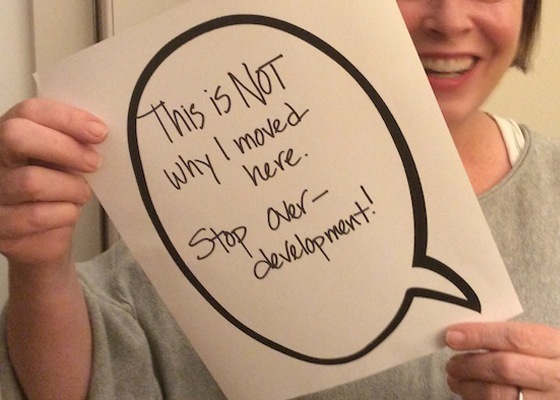 And the residents' voices must carry more weight than that of developers. Keep Middletown and Monmouth County Beautiful! 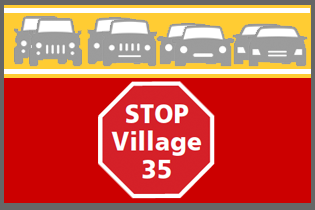 Say NO to Village 35!" "Kings Highway East is the only point of ingress/ egress to my home. Like all residents who live on the north side of Kings Highway East this road is our lifeline to the outside world. Adding the potential traffic from Village 35 is incomprehensible." ​"Middletown and the Route 35 corridor from Hazlet to Red Bank has enough empty storefronts. we do not need more shopping or housing. Preserve open space and keep Middletown from overdevelopment so it doesn't become a "sprawl" like Brick." "I want to continue being proud of Middletown and this will aid to it just being "another overcrowded Jersey shore town." "We have enough strip malls and condos. Middletown is looking a lot more like Staten Island than ever before and we don't want 25 kids per class in crammed spaces in Fairview." I pray that this does not get approved. There are too many negatives. Our traffic will be horrible and crime will increase. Please God do not let this go through. If it were a plus, we would not be requesting that Village 35 does not happen. Please do the right thing for us."